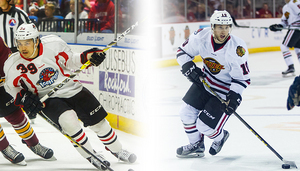 Rockford, Ill. - The Rockford IceHogs announced on Friday that they have signed left wing Tyler Sikura and right wing Alex Wideman to one-year, AHL contracts for the 2017-18 season. Sikura, 25, played 16 games in the AHL with the Iowa Wild last season. He also appeared in 39 games with the Toledo Walleye (ECHL), scoring 13g-16a-29pts, and eight games for the Manchester Monarchs (ECHL), posting 1g-4a-5pts. Sikura skated in 19 postseason games as well for Manchester, where he tallied 5g-6a-11pts. He also attended training camp with the IceHogs before the 2016-17 campaign. A native of Aurora, Ontario, Sikura's professional career includes 115 ECHL contests with Manchester and Toledo, where he has collected 30g-52a-82pts. He has competed in 22 games in the AHL with Iowa, the Portland Pirates, and the Springfield Falcons. The 6-2, 194 lbs. left wing attended Dartmouth College (NCAA) from 2011-15, serving as the team captain in each of his final two seasons. He was selected to the All-Ivy League First Team in 2012-13 after leading Dartmouth in goals (12), assists (20) and points (32). He finished his collegiate career with 36g-56a-92pts in 125 games. Wideman, 25, appeared in 70 games for Rockford's ECHL affiliate, the Indy Fuel, last season, leading the team in assists (33) and points (55), while tying for the team lead in goals (22). In 2015-16, he skated in 58 games for the Evansville IceMen (ECHL), notching 15g-24a-39pts. He also dressed for seven games with the AHL's Binghamton Senators that season. The 5-7, 161 lbs. forward started his professional career playing in four games for Binghamton at the end of the 2014-15 season. The St. Louis, Mo. native played four seasons (2011-15) at Miami University (NCAA) in Ohio, where he helped the Redhawks capture a CCHA Regular Season Championship in 2012-13 and NCHC Championship in 2014-15. He finished his collegiate career with 24g-32a-56pts in 140 games. Wideman played two seasons (2013-15) at Miami alongside Chicago Blackhawks prospect Anthony Louis. Single Game Tickets Go On Sale Sept. 14: The Rockford IceHogs return to action at the BMO Harris Bank Center on Saturday, Oct. 14, at 6 p.m. Single game tickets for the 2017-18 season will go on sale on Thursday, Sept. 14, at 10 a.m. Tickets will be available through IceHogs.com, by calling (815) 968-5222, or at the BMO Harris Bank Center Box Office. Single-game ticket prices start at $9 and range to $29. email and respects the privacy of its list members. To report abuse, please contact abuse@infinityemail.com.